The name refers to her passion for sleeping and dreaming. Since I absolutely share this passion with store owner Ina Solbach, I am absolutely delighted about her fantastic two-story flagship store on Schwabing's Habsburgerplatz. The interior designer always knew how important it is to maintain good sleep and good design in the bedroom. During a short personal crisis in 1999, she spent an entire weekend in bed and that is when her business idea hit her. A simple, yet original idea with a lot of potential for success. Apart from her store, she has several renowned department stores distributing her SUNDAY IN BED products, as well as fellow interior designers, linen and her own online store www.SUNDAYINBED.de. Beyond bed linen, her house brand includes night- and home wear, as well as beautiful throws and slippers, exclusively designed by Solbach herself. 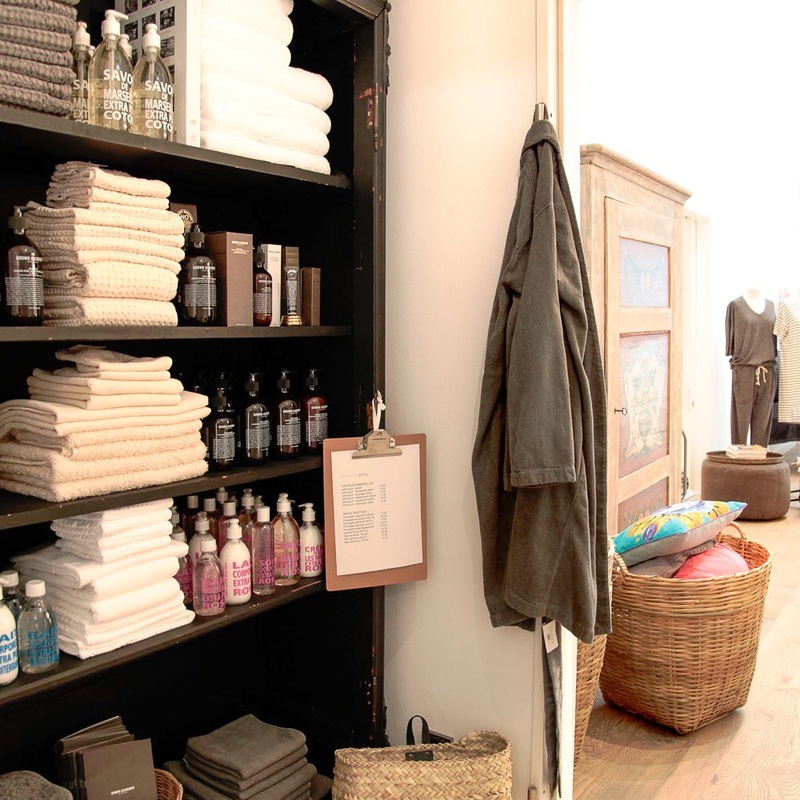 Solbach continues to travel from one fair to the next to hand-select beauty and spa, as well as children's products and new and vintage furniture for her store. You'll find beds by LETTI + CO, iron pieces by TOLIX, lighting by FLOS, ABYSS terry cloth and stylish, all-natural bags. I'm especially drawn to her selection bed linen, as every other pillowcase is displayed on the wall with the explicit request to „feel“ them – and so I do: the richest, softest cotton and finest Portuguese linen, also available in custom sizes. The colors are muted for the most part and range from white, beige, grey and taupe to powdery and blue shades. Bedding is made in Germany, by the way. Yet another reason for me to come here more often to treat myself to a new set of linens. I am sure I'll follow up with pieces by the night and home wear collections which is not only well-designed but made from silky smooth fabrics as well. I would love to just snuggle up in bed right here, with a show bathroom right next to it, presenting plenty of beautifully selected beauty and spa products by Australian label GROWN, Parisian fragrances by ETAT LIBRE PARFUMS and scented candles by MAD ET LEN. 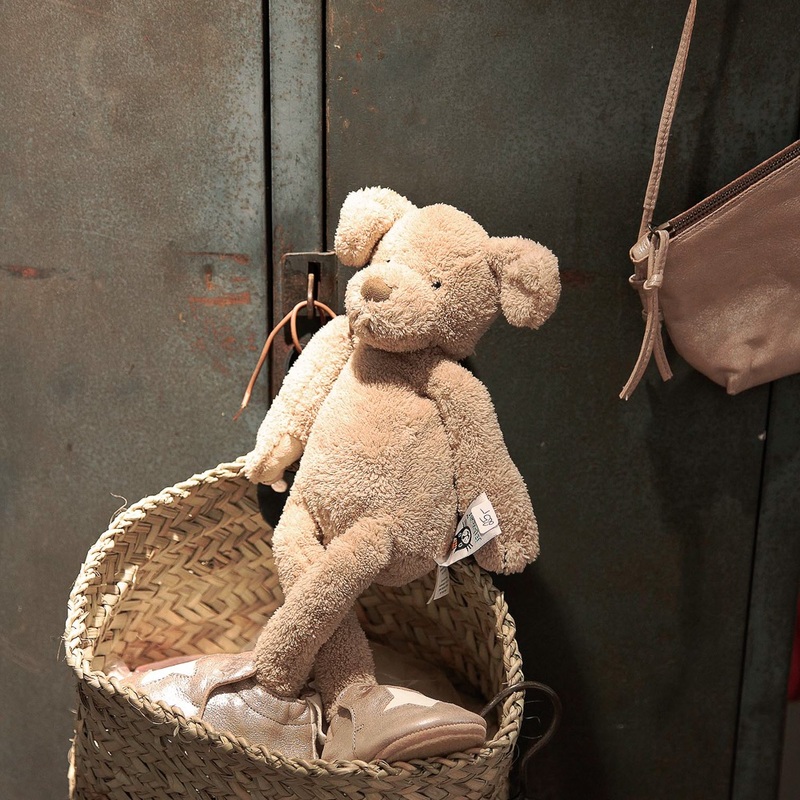 The children's collection is sold in a little department that is decorated like a child's room, presenting clothes, shoes, accessories, furniture and toys by labels such as FINGER IN THE NOSE, BOBO CHOSES, SOFT GALLERY, MINI RODINI and EAZY PEAZY. An extension of this area is already underway. SUNDAY IN BED becomes a true concept store more and more, and will soon be SUNDAY AT HOME, instead of "just" IN BED. That is the store owner's strategy. The sun is setting as I leave. See you, SUNDAY IN BED – I'll be back soon!